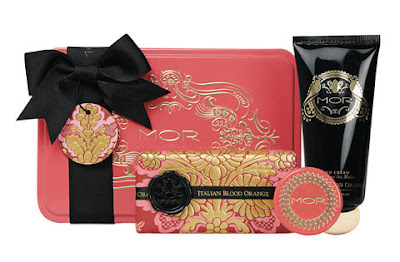 Like many a well-meaning and grateful type out there, MOR Cosmetics is getting ready for Mothers Day, although I think their beautiful gift sets could work on any occasion! The new releases in its Little Luxuries, Emporium and MOR Essentials lines are wonderfully fragrant as usual, as well as a total delight to behold and would be more than welcome in the boudoir of pretty much every mama that I know. My Fair Lychee is a super cute, rather ladylike inspired purse containing adorable Little Luxuries essentials, including a Hand Cream and Soapette scented in luscious Lychee Flower, whilst True Romance contains the Hand Cream and Soapette but scented deliciously in Marshmallow. Vanilla Allsorts is an assortment of bath and body essentials in a super cute collectable tin, including a full-sized Emporium Candied Vanilla Almond Soap & Hand Cream and a delicious French Vanilla Lip Macaron for your mum to indulge her sweet cravings. True Blood is similar in size and features a full-sized Emporium Italian Blood Orange Soap and Hand Cream with a delicious Blood Orange Lip Macaron for the full experience. Last but not least, the Quint-Essentially Gift Packs are a compact two-piece gift set that includes an Essentials Hand Cream 80ml and Soap Bar 170g enclosed in a travel anywhere-style carry bag and scented with either Neroli Clementine or Honey Nectar. Too delicious for words if you ask me!